An urgent need exists for therapies that protect against toxicities resulting from exposure to radiation in the context of terrorism, nuclear accident or war. Recognizing this need, the United States government has implemented initiatives to develop agents to treat civilian casualties and to protect emergency response personnel from such an event. The acute illness caused by exposure to a high dose of penetrating radiation to the body is referred to as Acute Radiation Syndrome (ARS). The symptoms are anorexia, severe nausea, vomiting, cramps and diarrhea. Subjects with severe cases of this syndrome usually die within 2 weeks. The cause of death is usually infection, dehydration and electrolyte imbalance as a result of destructive changes in the GI tract and bone marrow. Currently, only potassium iodide is recognized as a radio-protectant in this context, protecting only the thyroid from ingested radioactive iodine. 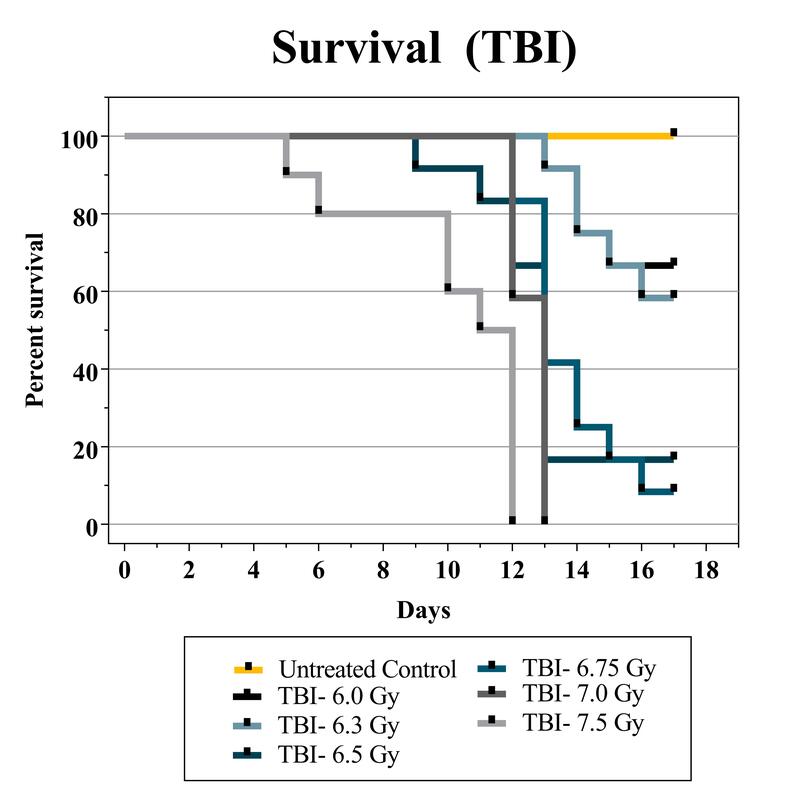 Our laboratory has developed both an ARS model using C57Bl/6 and C3H mice exposed to total body irradiation (TBI) or with shielding of the long bone to focus exclusively on toxicity occurring within the GI tract (GI-ARS). There is critical need to develop therapies to prevent radiation exposure related deaths resulting from gastrointestinal and bone marrow toxicities. 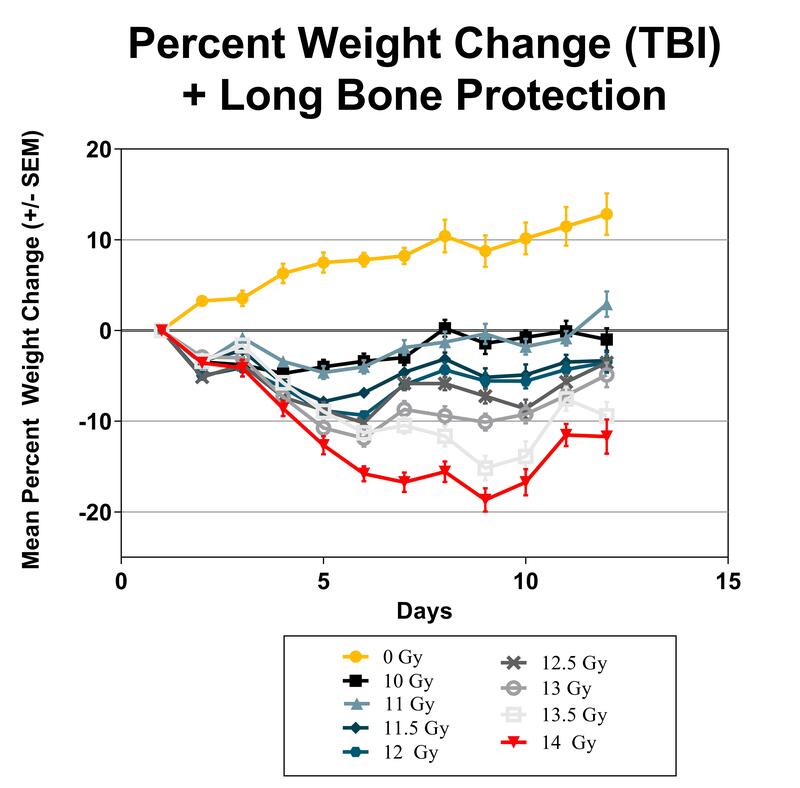 To test the efficacy of compounds that target the GI tract, bone marrow, or both, we have developed a mouse model of total body irradiation that represents the likely scenario of exposure in the human population. Animals are placed in a pie-shaped multi-chamber plastic restrainer and placed inside the radiation source. A single precise dose of total body irradiation at varying levels is administered to groups of mice to generate a dose response curve in both weight and survival. Compounds designed to prevent exposure related deaths can be evaluated on the basis of overall weight and survival alone, or additional histological endpoints can be examined to address the mechanism of action. Exposure to high levels of ionizing radiation results in toxicities of the gastrointestinal (GI) tract that often lead to death. There is a critical need to develop therapies that treat the damaged GI tract to reduce or prevent exposure-related deaths. 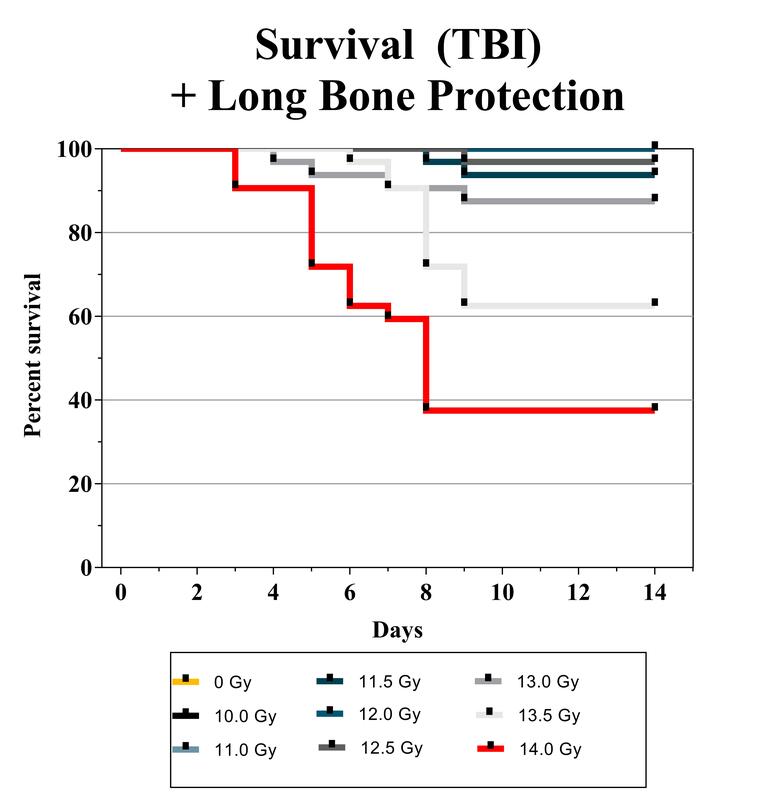 To test the efficacy of compounds that target the GI tract, we have developed a mouse model of total body irradiation with long bone protection so that the GI toxicities can be studies independently of those occurring in the bone marrow. Animals are placed in restrainers on a platform with lead shielding covering one hind limb. 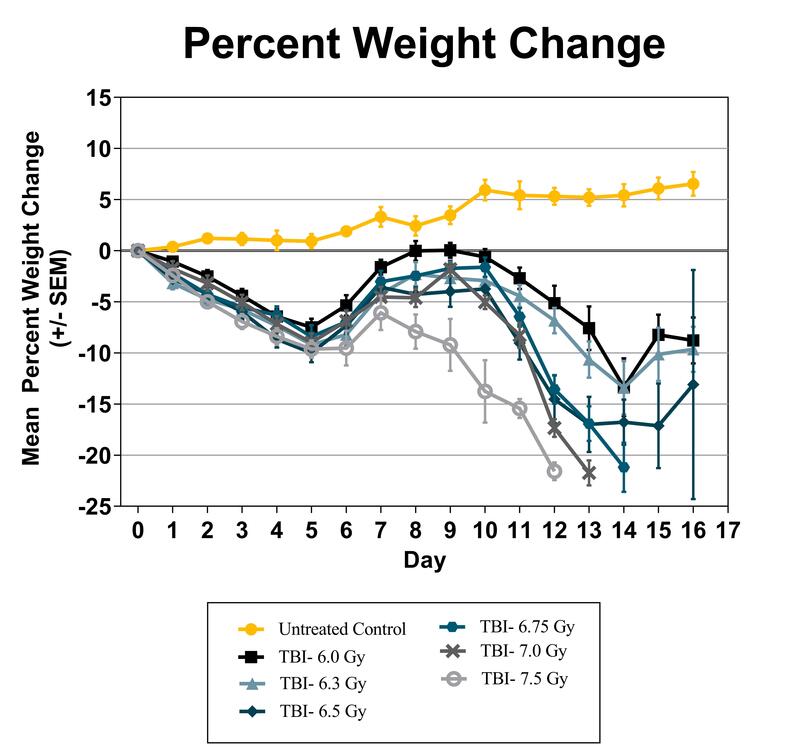 A single precise dose of total body irradiation at varying levels is administered to groups of mice to generate a dose response curve in both weight and survival. Compounds designed to prevent exposure related deaths can be evaluated on the basis of overall weight and survival alone, or additional histological endpoints can be examined to address the mechanism of action.